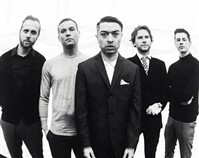 Back in 2015 The King Blues announced their return to the music scene after previously splitting up in 2012 and a few months later they went on to release their comeback EP ‘Off With Their Heads’ and since then The King Blues have been super busy touring alongside the likes of Enter Shikari and Skindred whilst also embarking on their own headline tours and now the band are gearing up to drop their fifth studio album ‘The Gospel Truth’ on the 14th April which will shortly be backed up days later with a lengthy tour of the UK. Throughout 2016 The King Blues were back on track with the band back stronger than ever but for Itch his personal life became a struggle and he went to some dark places but luckily despite discovering rock bottom he managed to work on rebuilding his life and whilst doing so he set out to write the most personal and honest record of his career and that is exactly what he has done with ‘The Gospel Truth’ and musically it is up there as one of the best albums of The King Blues career an album which their legion of fans are easily going to listen to on repeat. The album opens with the spoken word track ‘The Truth, The Whole Truth’ and it is a truly honest hard hitting track where fans of the band have reached out to Itch about the struggles and suffering they have gone through with people talking about their struggles with depression and anxiety which effects everyone in different ways and it really lays the theme of the album open on the table right from the start. The band then kick into their recently released single ‘Heart Of A Lion’ the song is as big as it is infectious, it oozes in radio friendliness and instantly works its way to become yet another The King Blues infectious anthem which easily has to be on the bands live set list ongoing. >There are many upbeat moments on ‘The Gospel Truth’ such as the anthemic ‘Bullingdon Boys’, the infectious ‘New Gods’ , the sing-a-long ‘Wish You Weren’t Here’, the straight up awesome ‘America Don’t Want Me’ and the angst ridden mosh pit anthem ‘Getting Better’ which is bound to see a few circle pits open at the bands shows. In-between the above mentioned upbeat moments there are also some dark moments and toned down moments on the album such as the dark themed acoustic number ‘The Truth Comes Out’, the near spoken word ‘Nike Town’ and album closers ‘You’ve Taken My Spark’ and ‘And Nothing But The Truth’ which closes the album in a similar way to how the album opened. 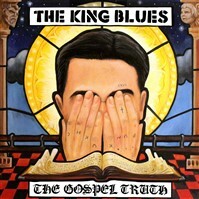 With ‘The Gospel Truth’ The King Blues have come back and created their biggest most diverse and honest sounding album ever it has many anthems which are sure to instantly become live favourites within their fan base and they also have some hard hitting honest moments lyrically whilst instrumentally The King Blues prove that punk rock is very much still alive and kicking.